Now you can easily access our KBA videos from mobile devices. 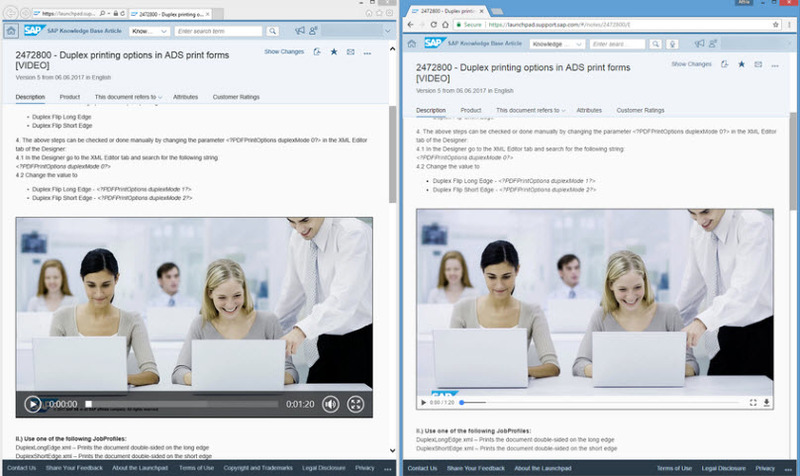 We recently introduced a new method of video playback for KBAs hosted on the SAP ONE Support Launchpad. The video playback has been changed to HTML5 which means that there is no separate embedded player required but instead, it is handled natively in the browser. The playback will work on all devices where an HTML5 compatible browser is available. As the SAP ONE Support Launchpad works with such browsers, every customer can enjoy this new feature moving forward. The video will automatically be resized to the browser resolution which ensures a much better user experience on mobile devices. After the new player was implemented we started to check it internally with a few users. We could make some tests with mobile devices also. The results were promising. It was working as expected in all cases. Before we switched it live for the customers, we wanted to verify that they have the same experience. To do so, we asked some of our customers who already helped SAP in such cases: we approached a handful of them via email describing the situation and provided the possibility to test the new video playback in advance. Luckily we have some customers who were able to check the behavior in the given timeframe based on the test case I prepared for them. The feedbacks were the same as we saw in the internal tests: all positive. They also provided additional information, that we can use later to enhance the video offerings. As it was technically possible, we could switch on the new function in the SAP ONE Support Launchpad without delay after the customers’ tests. Where are we at with regards to KM Videos? In the first half of 2017, 34 KBAs with embedded videos were created. 10 of these KBAs are Expert Webinar sessions, where the recording of the live presentation is provided as a video, so that additional customers can review it later. Overall there are over 400 video KBAs available already. Chusa, thanks for an update! It’s great to have this option and not dealing with any additional players seems like great news. I’ve just checked the note in your screenshot (link) but am not hearing any sound in the video. Is it just silent? I’ve also had some problems with un-muting it first but then realized I had “play sound in web pages” switched off in the browser settings. I do that to prevent unexpected loud noises in the office (some pages just love to pop up the ads or start playing videos at once). But even after resolving that and reloading the page – can’t hear anything even though the sound is on in every possible place. Unrelated question – can the notes with videos be found by using [VIDEO] keyword? And are there any plans to add videos to some older KBAs? we do not have audio for every videos. In fact only some of them has also audio part. Just a remark: notes do not have videos inside, only KBAs can have embedded videos. If you search for the [video], than you will get the KBAs with videos inside, if the keyword is in the sort text. What is the fundamental technical difference between the note and KBA? From the customer side, they look pretty much the same in Launchpad. Wouldn’t it be beneficial to have a video in some notes too? For example, there were several notes delivered as a result of the recent Customer Connection project in SD. In the online meeting, the project team showed us some short demos (a minute or so) of how the functionality would actually look if implemented. But someone who has not seen those demos and only reads the description in the note and long list of manual changes might have difficulty visualizing how this would all work in the end. And whether going through all the manual activities will be worth their while. (And undoing this stuff can be extremely painful.) So I was actually going to email the project manager and inquire if they could add the demo videos to the notes. But now you’re saying it’s not feasible. Why? They say a picture is worth thousand words, so a video should be worth even more, shouldn’t it? Currently only KBAs can contain screen shots and videos and in addition you can rate them and/or provide comments via free text field. I will share your feedback with the SAP Notes process owner. Thanks for a reply. I understand how they are different in functionality. What I was asking was more along the lines of technical differences, as an asset. For example, we have blogs and questions on SCN. Those are different not just because they serve different functions but also because one is using WordPress platform while the other AnswerHub. Is there similar major difference between the SAP notes and KBA? Are they somehow stored differently? Because they look almost exactly the same in Launchpad (except for start rating). I’m just trying to understand if there is an actual technical difficulty or it’s just someone made a decision on what features to allow or not. SAP Notes and SAP Knowledge Base Articles are 2 different document types which are stored on the same system but offer different features based on business decision.